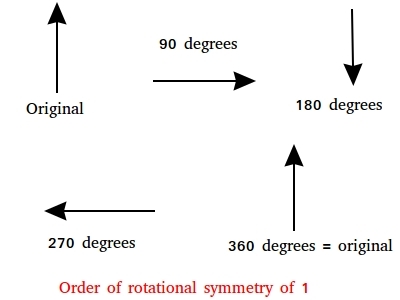 The order of rotational symmetry of a geometric figure is the number of times you can rotate the geometric figure so that its looks exactly the same as the original figure. You can only rotate the figure up to 360 degrees. Let us start with a shape that has an order of rotational symmetry of 1. 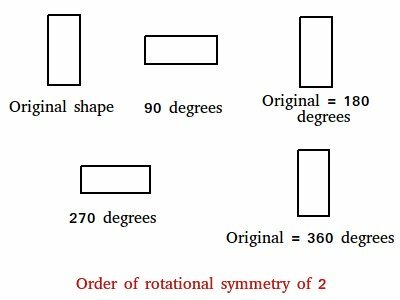 A rotational symmetry of order 1 means that the shape will look like its original only once after you rotated the shape 360 degrees. The arrow you see below has a rotational symmetry of order 1. Notice that you could not get the original arrow until you rotated the arrow 360 degrees. You do not need to do 90 degrees rotation each time. You can rotate the arrow any amount of degrees you like to see if you will get the original arrow. In our example above, we rotated a rectangle 90 degrees each time. Notice that we were able to get the original shape twice. The first time we got the original image, we got it with a rotation of 180 degrees and the second time, we got it with a rotation of 360 degrees. Since we were able to return the original shape 2 times, the rectangle has rotational symmetry of order 2. In this last example above, we rotated a hexagon 60 degrees each time. Each 60 degrees rotation returns the original shape as you can see above. 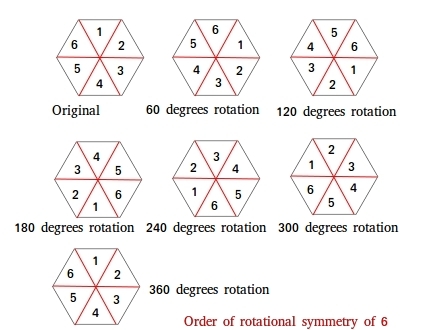 Since we were able to return the original shape 6 times, the hexagon as rotational symmetry of order 6.